Read here about Sarah Margaret Fuller Ossoli, commonly known as Margaret Fuller, an American journalist, critic, and women's rights advocate who played a critical role in Richard Buckminster Fuller's intellectual development. Margaret Fuller (1810 – 1850) played a critical role in the intellectual life of Richard Buckminster Fuller, as he first embarked on his course of research that led to his development of tensegrity. Brief biography of Margaret's life. A short biography and timeline is presented to provide context for the article. For an in depth treatment see the 2013 Pulitzer prize-winning [Fuller: A New American Life By Megan Marshall]. Sarah Margaret Fuller Ossoli (May 23, 1810 – July 19, 1850), commonly known as Margaret Fuller, was an American journalist, critic, and women's rights advocate associated with the American transcendentalism movement. She was the first full-time American female book reviewer in journalism. Her book Woman in the Nineteenth Century is considered the first major feminist work in the United States. Born Sarah Margaret Fuller in Cambridge, Massachusetts, she was given a substantial early education by her father, Timothy Fuller. She later had more formal schooling and became a teacher before, in 1839, she began overseeing what she called "conversations": discussions among women meant to compensate for their lack of access to higher education. She became the first editor of the transcendentalist journal The Dial in 1840, before joining the staff of the New York Tribune under Horace Greeley in 1844. By the time she was in her 30s, Fuller had earned a reputation as the best-read person in New England, male or female, and became the first woman allowed to use the library at Harvard College. Her seminal work, Woman in the Nineteenth Century, was published in 1845. A year later, she was sent to Europe for the Tribune as its first female correspondent. She soon became involved with the revolutions in Italy and allied herself with Giuseppe Mazzini, leader of the Italian Republican movement. She had a relationship with Giovanni Ossoli, with whom she had a child. All three members of the family died in a shipwreck off Fire Island, New York, as they were traveling to the United States in 1850. Fuller's body was never recovered. Fuller, Margaret, daguerreotype in case (with cover missing), before 1850. Depicts Fuller seated, with left hand touching left side of head, elbow on desk and looking down at a book. White shawl covers both shoulders. Right side of face is shown with braided hair wrapped around exposed ear. Harvard Library. Fuller was an advocate of women's rights and, in particular, women's education and the right to employment. She also encouraged many other reforms in society, including prison reform and the emancipation of slaves in the United States. Many other advocates for women's rights and feminism, including Susan B. Anthony, cite Fuller as a source of inspiration. Many of her contemporaries, however, were not supportive, including her former friend Harriet Martineau. She said that Fuller was a talker rather than an activist. Shortly after Fuller's death, her importance faded; the editors who prepared her letters to be published, believing her fame would be short-lived, censored or altered much of her work before publication. Margaret Fuller is acknowledged to have directly influenced important American intellectuals and artists. Her work in Concord, Massachusetts affected Ralph Waldo Emerson, Henry David Thoreau, Louisa May Alcott, and Nathaniel Hawthorne, their neighbors Henry James, Oliver Wendell Holmes, and a larger circle of friends including Herman Melville, Walt Whitman, and Edgar Allan Poe. She also affected women leaders such as Susan B. Anthony. 1817: Father elected representative in the United States Congress. Spends four to six months a year in Washington, D.C. for the next eight years. 1820: At age of 10, Fuller writes, "On 23 May 1810, was born one foredoomed to sorrow and pain, and like others to have misfortunes." 1822: Read Adam Smith’s Wealth of Nations at age twelve. 1825: Father's Congressional term concludes, transitions into a law practice. 1826: Returns home at the age of 16. Begins self-study in classics, modern languages and literature. 1829: Death of her infant brother, Edward, in her arms, before his second birthday, unknown illness. 1831: Crisis of personal identity, Thanksgiving day November 26, 1831. 1833: Father's law practice fails, moves family to a farm in Groton. 1834: First published work, a response to historian George Bancroft in the North American Review. 1835: Publishes more, suffers migraines and fevers. Father dies of cholera on October 2, 1835, leaving no will. Vows to act as head of the family. 1839: Begins overseeing "conversations": discussions among women meant to compensate for their lack of access to higher education. 1845: Publishes seminal work, Woman in the Nineteenth Century. Edgar Allen Poe reading her work. 1846: Sent to Europe for the Tribune as its first female correspondent; marries Giovanni Ossoli, with whom she had a child. 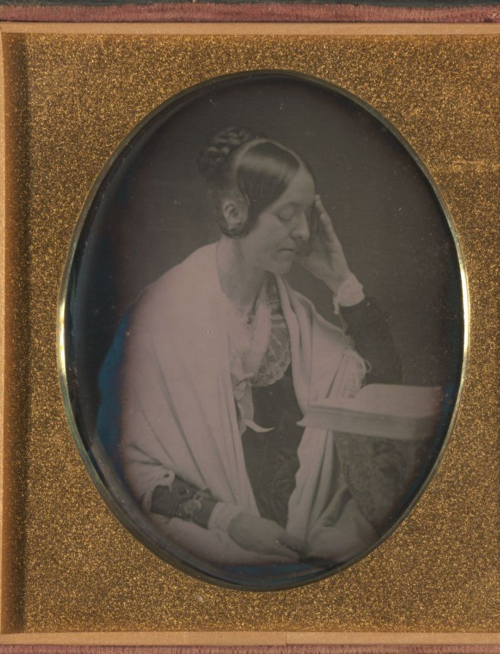 Only known daguerreotype taken of Margaret Fuller by John Plumbe. 1848: Meets John Carlyle in England. 1850: Died, July 19, 1850 (aged 40), off the coast of Fire Island, New York, U.S.
Margaret Fuller suffered a Personal identity crisis that changed her permanently and determined her lifelong motivations. She eloquently documented the crisis, its build-up, moment of revelation beside a leaf-filled pool of water deep in a wood, and aftermath. These passages were reprinted later in “Margaret Fuller and Goethe”, a book that deeply impressed Bucky as reflected in letters he later wrote to his sister and mother. Eldest daughter to a large family, Margaret Fuller was born in 1810 and quickly assumed two responsibilities: care for her growing family--her youngest sister was born when she was eighteen--and master the curriculum reserved at that time only for boys, including Latin, Greek, Italian and French. She excelled, reading Shakespeare at age eight and Adam Smith’s Wealth of Nations at age twelve. She continued her schooling and voracious study in Cambridge and Groton. Margaret was not always happy, being a motivated young woman in the nineteenth century. Though smart, she was considered plain, not pretty, and haughty, not modest. In Cambridge in 1826, attaining the age of sweet sixteen, she began a period of study, meditation, and inner struggle with classic questions of personal identity such as “what is life,” “what is God,” and “what am I?” By nineteen she considered herself unlucky in love, but the intellectual superior of her classmates, which included later luminaries such as Oliver Wendell Holmes. Her father suffered a career setback and relocated the family to a remote farm, separating Margaret from any intellectual stimulation. This pain, combined with her increasing disillusion with conventional religion, culminated in her contemplated suicide. > I remembered all the times and ways in which the same thought had returned. I saw how long it must be before the soul can learn to act under these limitations of time and space, and human nature; but I saw, also, that it MUST do it,--that it must make all this false true,--and sow new and immortal plants in the garden of God, before it could return again. I saw there was no self; that selfishness was all folly, and the result of circumstance; that it was only because I thought self real that I suffered; that I had only to live in the idea of the ALL, and all was mine. The sun shone as before upon her in the wood, before the little pool of water, but Ms. Fuller was forever transformed. Her personal identity had become stripped of conventional anchor points such as father, family and nation. Instead, the central idea of her thought became the ineffability of Truth. She had a direct experience of the unity of time and space, and a vision of the role of humanity within that unity: to act on behalf of all life. Her thought and personality changed forever. She returned home a different person, and remained true to the perspective that she gained that fateful day through the rest of her difficult life. She embarked on a controversial life of letters and wrote about human nature, harmony, good and evil and patience. Margaret Fuller's work is significant as her writing was a formative influence on Richard Buckminster Fuller's intellectual development, which led to the discovery of tensegrity as we know it today. For details, read here. Detailed quotes from Marshall's new biography can be found here. Wikipedia article on Margaret Fuller, [] Author Megan Marshall's webpage on her 2013 Biography of Margaret Fuller [] Margaret Fuller House, official website: [] Read more about Personal identity. This page was last edited on 24 November 2018, at 10:37.